How do you cut and mark your fabric? Cutting fabric used to be my least favorite part of the sewing process. But then mid-last year I bought this absolutely fabulous bright daylight lamp (the kind professional photographers use) which gives off so much light that it literally looks like sunshine, even in the middle of the night. That light made all the difference – no longer a dreaded chore, cutting has become fun. So much so, that I want to show you how I do it. You know, in case you like some of my ideas, or have some good ones of your own to share. I use pattern weights to hold the pattern in place. I occasionally dream about getting those large ones professional patternmakers use but, ugh – shipping and storage and moving… I’ll stick with the little guys for now. I use a rotary cutter to cut the fabric. On a quick and easy project, I just cut right around the pattern piece. On more involved projects with odd layouts, I trace around the pattern pieces with chalk, then cut. My patterns have notches for matching seams and holes for marking inside the pattern piece, such as for darts. Because the paper is so thin, I reinforce the area with clear tape, both front and back. I consider this an integral step of pattern preparation, right before cutting it. Then I notch the notches and punch the holes. When the paper comes off, I connect the dart dots with a thin line of chalk (I like the pen-style Chaco liners) using a straight and/or curved ruler. For double-ended darts, I also mark the center line so that I have a straight line to follow when folding out the dart. If a piece is cut on fold, I flip it over and mark it in the same way. Now, I only do this with stable fabrics. Anything shifty gets cut single-layer. 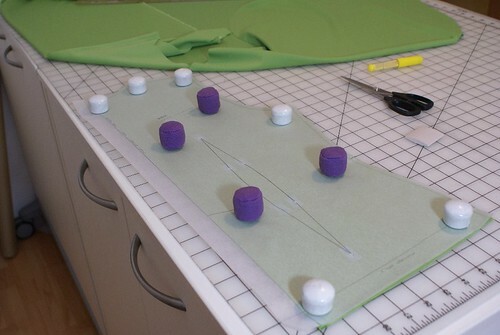 Once I have the chalk lines in place, I pin the darts so they’re ready to sew. Then, and only then, does the cut piece move from the cutting table to the sewing table. 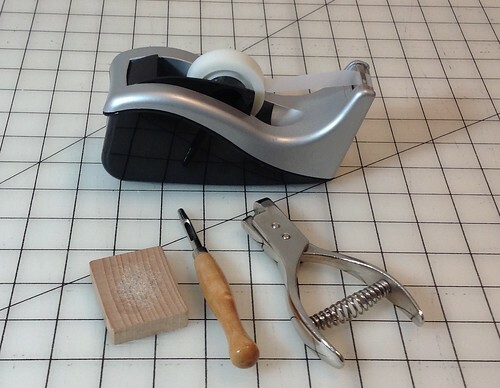 So, please talk to me: how do you cut and mark your fabrics? Are you partial to rotary cutters or do you prefer shears? 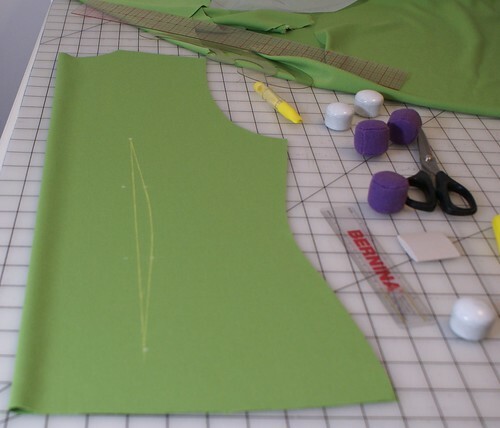 How do you transfer dart and other important markings from pattern to fabric? I never cut garments with rotary cutters (still scared). I might not even have rotary cutters because I use them so infrequently. Others would consider my pinning overkill, because I know I use far to many of them. I occasionally use tracing paper/wheel to mark darts, but will also use tailors tacks as well. I’ve got some pretty weights, but rarely use them either. I actually cut matching notches, yes I know it’s much quicker if you don’t. But that’s just the way I am (sign). Interesting to hear about the fear of rotary cutters. I find them super easy. They’re really not scary at all. Maybe something for you to tackle as part of your Fearless February project? I had a bit of a chuckle over this one – eyeballing things as you go. And here I stress over every 1/4″ on the paper pattern. I’m going to try to be more relaxed about things. I love your idea of reinforcing the pattern and then using the chalk that way! I have to try that. Cuz I sure do hate this stage of the process. If you try it, please let me know how it worked for you. Interesting to hear what people are doing. I cut with scissors, always mark my darts. Depending upon the fabric, I mark the points of the darts with a marking pen or chalk or I use tailor tacks. I use tailor tacks a lot actually. Interesting that you use tailor tacks a lot. I tend to think of them as special-projects-only (think French jacket kind of special). I use large washers as pattern weights and cut with a rotary cutter. I snip the notches with sharp scissors. For internal marks I use transfer paper or tailor tacks. I’m always afraid marking pens either won’t come out or will disappear before I’m ready to sew. I sew a lot with knits and end up cutting out single sided. I understand about the marking pens. I don’t use them. But I’ve had yellow chalk cling to the inside of a dart on a white linen blouse, too, so it’s not foolproof. I use both a rotary cutter and my Gingher scissors, it just depends on the fabric. I pin or I use my wonderful weights my mother-in-law made me out of polar fleece tubes filled with bb’s. I mostly use Choco liners and taylor tacks. I love your idea of reinforcing the pattern with tape and using a hole punch. Thanks! Polar fleece tubes filled with bb’s? What a fabulous idea! I must try that soon. Thank you!